On behalf of the men and women of the Sycamore Fire Department I would like to thank you for visiting our website and for your interest in our Department. Our personnel are committed to service to the community. Our organizational values of Dedication, Honor, Teamwork, Trust, and Safety are present in everything we do. Our values coupled with our Organizational Mission serve as guiding principles to provide the high quality service to our residents. It is our honor to serve the residents, businesses, and visitors of the Sycamore community. If we can be of any service to you, please contact us. 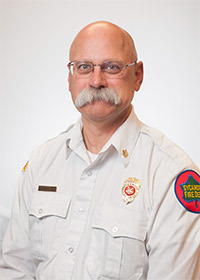 The Sycamore Fire Department provides 24-hour emergency response, operating out of two fire stations with 36 personnel. The Fire Department is divided into two divisions; an administrative division and an operations division. We provide Fire Suppression, Rescue, Emergency Medical Services, Hazardous Materials First Responder, Fire Prevention, and Public Education services to approximately 20,000 people. This service area includes the City of Sycamore (17,519 residents) and the Sycamore Fire Protection District (approximately 2,500 residents). Overall, we service an area of approximately 62 ½ square miles (City 5.57 square miles) . The Insurance Services Organization (ISO) rating for the City of Sycamore is a Class 4 and the ISO rating for the Sycamore Fire Protection District (unincorporated area outside the city) is a Class 8B. Approved staff positions (40-hour week), include Fire Chief, two Assistant Fire Chiefs, and one Secretary. Approved full time shift staffing is provided by three shifts of 8 full-time firefighters (2 Lieutenants and 6 firefighters) on a 24/48-hour schedule, and is supplemented with 9 paid-on-call firefighters. Daily minimum staffing is 6 firefighters per shift. In Fiscal Year 2016-2017, the Fire Department responded to 2,188 incidents. About 82% of the incidents were emergency medical services-related. For more information about the Fire Department emergency and non-emergency activity, please access the Fire Department’s Annual Report.